A lot of walking, and some exploring via streetcar. Taking the streetcar down St. Charles Avenue sounds heavenly. 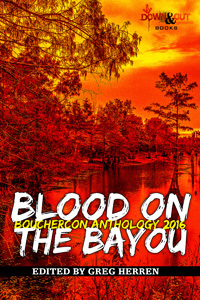 So, Dear Reds, raise your hands - who's going to New Orleans for Bouchercon? And what fun things do you have planned? It sounds as if you’re all set to have a marvelous time in New Orleans, Kaye! It all sounds marvelous and exciting and I hope you’re planning to share your adventures with us after you get home again . . . . I'll be there, looking forward to hugging your neck, Kaye. And staying with a friend in the Garden District, right down the street from where both Sandra Bullock and John Goodman live, and close to Commanders Palace. We intend to have at least one Sazerac together. If you are bold enough, try a traditional absinthe at Pirate's in Pirate's Alley near Jackson Square. My advice is to share one with a friend, at least the first time. They can knock you on your keester. 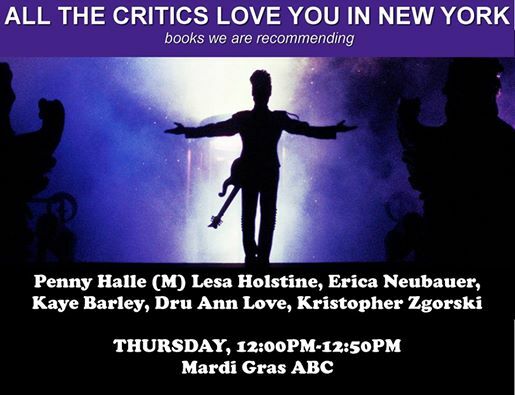 I will be there, Kaye and am looking forward to exploring New Orleans and surrounding areas. I also read Eat Dat and Fear Dat and have subscribed to several on-line blogs/newsletters to do some background prep on NOLA. And I like to read new (to me) authors with NOLA-based stories before travelling down there: I chose Bill Loehfelm, Laura Morrigan and Traci Andrighetti to read this week. The Cemetery/Voodoo tour and cooking class sounds wonderful. 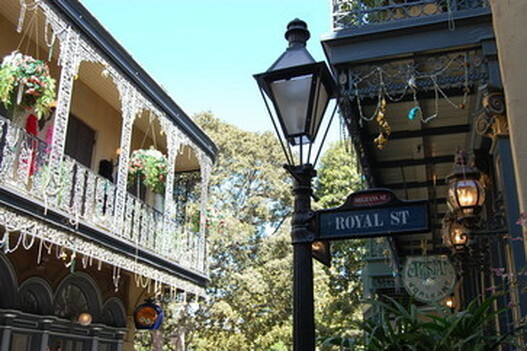 For non-Bouchercon activities, I will also be travelling on the St. Charles streetcar and exploring several neighbourhoods on foot or bike both before and after Bouchercon. I am planning to go on a swamp/plantation tour. And I will definitely go to Frenchmen Street for live music. And eat, eat, eat, and try a few unique cocktails I have heard about. As for Bouchercon-related activities, I will be going to Noir at the Bar on Wednesday, and Ellen Byron's book launch on Saturday. And I am looking forward to the Kathy's pre-Bcon dinner on Tuesday and meeting you (and others) in person! The rest of my itinerary is a bit vague. I am leaving it open to allow me to wander and explore new areas and try new things that I hear about while there. I thought 11 days in NOLA was enough, but now I am not sure! I think I'm going to just tag along with you, Kaye! I'm flying in on Monday, because I've never been in NOLO, but I'm afraid I'm going home directly on Sunday.I'll be at the Tuesday dinner and hope to find some history during the day along with good eats and drinks. And I'll be signing right next to you on Saturday. Really looking forward to that. The Wicked Cozys are organizing a Cozy Meetup Friday at noon, y'all. Stay tuned for location. I will be there and ready to see, eat and possibly sleep New Orleans. I'm arriving early to get in some pre-Bouchercon fun with some friends, including you. Looking forward to the 2-hour highlights tour of New Orleans, the cemetery tour and a night out at Preservation Hall and of course a trip to Cafe du Monde. I'm also interested in the Audubon Butterfly Garden and Insectarium, the Audubon Aquarium, the National WWII museum and riding the various streetcars to get a feel for the city. Hi Kaye! What a great post! 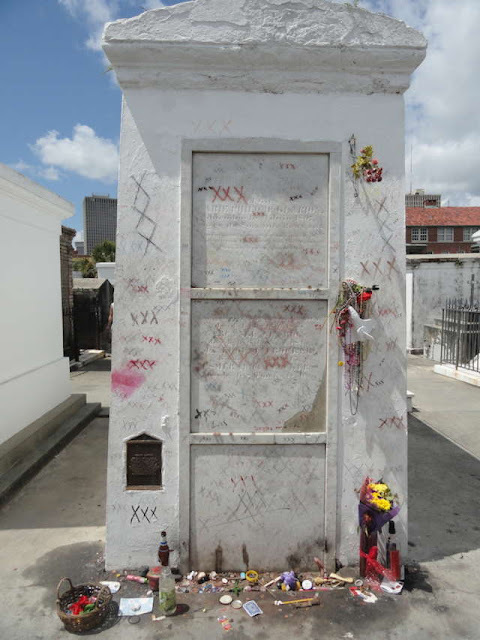 The MacNeal crypt is in NOLA, so I might be joining you, to pay respects. Also excited to go to the WWII museum. I'll be there, but I'm afraid I"m planning on serendipity. I won't be there as long as you because of work, and, of course the awards and parade are on Friday night, and I"m leaving on Sunday. So, I'm just going to wait to see what happens and who I run into. But, I'm lucky to have a great roommate who seems to have a lot of ideas for celebration! Joan - I'm pretty excited. And you know I'll have photos and stories to share. Karen, hi!! Looking forward to seeing you and sharing a hug. I'm not much of a drinker, so I'll let you and others sample these exotic adult beverages and then tell me all about 'em. I am looking forward to a little lemoncello (homemade) get-together I've been invited to. Lesa introduced me to lemoncello last year in Raleigh, and being a lover of all things lemony, I became a big fan quickly. Grace, I look forward to meeting you! And I agree, 11 days seems like a nice long visit, but maybe not quite long enough for New Orleans. SO much to do! Edith, I know we'll be bumping into one another all over the place. Looking forward to our dinner and very much looking forward to our signing. Dru - "possibly sleep." Yes. We do need to try to do some of that, don't we? I can't wait to see you - don't we have some fun things planned?! Susan, I kinda love that the MacNeal crypt is in New Orleans, and it's only right that w all pay our respects. Hallie - you will be missed!!!! I'm not a big fan of pralines, truth be told, but Don Barley is. I'll let you know how that goes. Thank you, Lucy/Roberta. You will be missed! I'll have a beignet, or two, for you. I'll be there! Sadly I won't be able to come early and stay late, but I hope to take in as much New Orleans flavor as I can from Wednesday to Sunday. Annette, it'll be fun. See you soon!!!! Tuesday to Sunday for me--boo. But I'm very excited as I haven't been to NOLA since I was a teenager. My kiddos, who LOVE New Orleans, will be there Wednesday to Saturday, so I'm counting on them for eating and sightseeing advice. I'm looking forward to seeing so many friends (and my lovely editor.) I know the days are going to fly by. Kaye, can't wait to hug you!!! PS: Does anyone know who has the best fried oyster poboys? Love them!!! I think to get in the mood I'm going to watch The Big Easy this weekend. One of my all time favorite movies--and soundtracks. I will chase you down for that hug, Debs! The Big Easy! I love that movie - what a great idea!! And YOU all will be my favorite sights in New Orleans! Cannot wait to see you.. 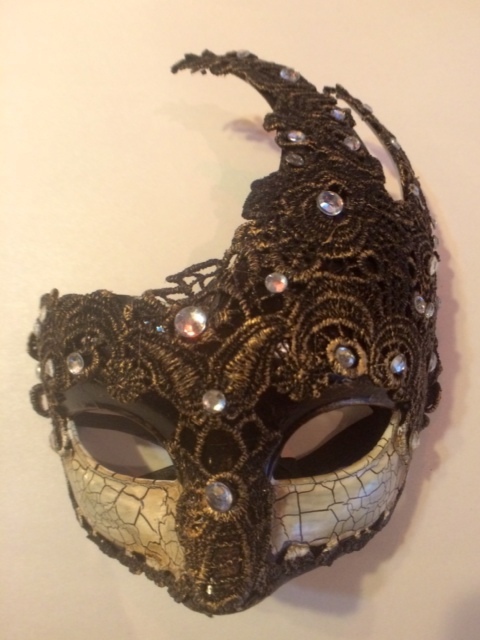 Though I will not attend Bouchercon in New Orleans, I look forward to reading about your trip and look forward to reading comments by other JRW authors and commenters. I do plan to attend Bouchercon in Canada next year. Who plans to attend Bouchercon in Canada next year? Diana, I am already so sad not to be going to Bouchercon next year!!!! Hope to see you to say hello, Angela! Enjoyed your post. Thrilled to be joining you in NOLA and my first Bouchercon! I’ll be helping with the Silent Auction so I hope you will come by and bid on something fun! Looking forward to seeing everybody in New Orleans. I haven't been for many years and looking forward to that great food. Oysters. Craw dads. Oh, and beignets at Cafe du Monde. And the streetcar on St Charles Street. Three of us Reds are on a panel on Saturday and we'll be sharing our stories from the road--signing and speeches, the strange, the funny and the terrifying. Should be fun. Normally, I would have read your post this morning, Kaye, but the grandkids have been here, and everything else had to wait. I do believe I will run into you in NOLA, Kaye. Hahaha! I am so looking forward to spending time with you. As well as Tuesday night, you and I have to go for coffee and beignets at Cafe du Monde, as we love coffee so much. Dru, maybe the three of us and whoever else can plan a Cafe du Monde visit. Being a fan of cemeteries, visiting them, I would like to do a cemetery tour. Kaye, I'll need to ask you more about the one you're going on. The WWII Museum is definitely on my list and lingering in some art shops (maybe we can hit Julia St. together, Kaye). Eating, of course, is a major attraction, and I have several restaurants already scheduled. I'd love to do a ghost tour at night, but I don't know when I can fit it in. And, of course, the panel with the Reds on it is on my panel schedule. I'd like to find some brave soul who want to try the absinthe at Pirate's in Pirate's Alley. I'm not sure I'm brave enough, but I'm fascinated by the history of absinthe. The Tuesday night dinner and music gathering I've planned is going to be so much fun with the amazing people attending. Dru, Edith, and Grace are coming along, and Kaye, I think you've decided on just the music and not dinner. Is that right? Maybe I can twist your arm on that one. Terry Shames and Judy Bobalik will be joining us, too. If anyone here on the blog, Reds authors or others, want to join us for our Tuesday night outing, just let me know, so I can watch for you when we gather in the hotel lobby. We will be meeting in the Marriott lobby on Tuesday the 13th around 4:30 and walking to a restaurant, probably Napoleon House (I want to go to try a Pimm's that they're famous for). Napoleon House is about a 6 minute walk, and then we will go to Preservation Hall for a show, or, since we are being flexible that night, maybe another music venue instead. Anyone is welcome to go with us. I have a close friend, grew up next door to each other, who is currently on his honeymoon in New Orleans right now, and he is going to send me some suggestions of what he and his husband enjoyed the most. They are having such a great time there that he messaged me they are planning to spend a month each year there when he retires. I can't wait to get the list from him. I should arrive around noon Monday at the Marriott and am leaving the next Monday afternoon. My adult daughter is joining me on Tuesday until Sunday, but she's not attending Bouchercon. Debs, she and Katie would probably hit it off. Also, Debs, Diana C. and I are planning to get together sometime, as well as Karin. In closing here, I can only say that I have lots to do this next week to get ready, and I can't wait to get there and see everyone. I, too, am new to lemoncello, Kaye, from Raleigh and will see you at the get-together featuring it. I will really miss seeing Hallie, Julia, and Roberta. So, Kaye, let's get our chicken beaks on and start clucking to NOLA! Manning, you are going to love your first Bouchercon, I guarantee! I always love the silent auction, so yes - I will see you there! Looking forward to seeing you, Rhys! Kathy. You have made me laugh (so, what's new, huh?!) I'll send you a note. Reds, chances are if you see Kathy, you're going to see me - and vice versa. And there may be chickens . . . I went to high school in New Orleans (at Ursuline Academy, those of you who know New Orleans will know Ursuline). It is one of my favorite cities on earth because of the people the food the music the dancing the shopping the joie de vivre. Not to mention the booze. Which is why I visit as often as possible. I always try to eat my way through the city, starting at the Gumbo Shop and Cafe du Monde to the College Inn and Commander's Palace (my fave restaurant in the world). Fortunately I'll have to walk a lot all over the French Quarter in search of the perfect New Orleans memento and that sort of helps to burn off all those calories. I just bought two pairs of linen pants anticipation of these walks, because it will be hot, people. And I have to look presentable, not just at the conference where I have so many friends and clients on panels, but at the publishers' parties, which are at cool places like Galatoire's and Brennan's. If only Bouchercon were in NOLA every year! This will be my first time at BoucherCon and New Orleans, so I'm both super excited and a little nervous. Unfortunately, I'm going to miss a good chunk of BoucherCon, because I arrive late Tuesday night, but leave on Saturday. My job doesn't offer paid vacation, so even this short trip is a bit of a splurge for me. The only thing I know I'm doing for sure (other than eating everything in sight) is the SinC workshop on Wednesday. Walter Moseley is the keynote speaker and the topic is Writing Our Differences - Doing Diversity Right, which is a topic that's very important to me. Other than that, hoping to check out the Guppie meetup and just wander around taking everything in. A friend of mine will be on the trip, but she's not a writer or mystery fan, so the plan is to do BoucherCon stuff during the day and hang out with her at night.